Water. A daily part of living for us. A luxurious privilege for others. Like most families in Honduras, this family of 12 struggled every day to provide water. Simple American amenities such as running showers and functional plumbing systems do not exist in much of Honduras, so many Hondurans spend most of their days simply meeting their daily needs. Many use trees as restrooms and must walk long distances to shower. HOPE Coffee has seen this great need in Honduras and used it as an opportunity to minister to the community and share the love of Christ with the needy in practical ways. 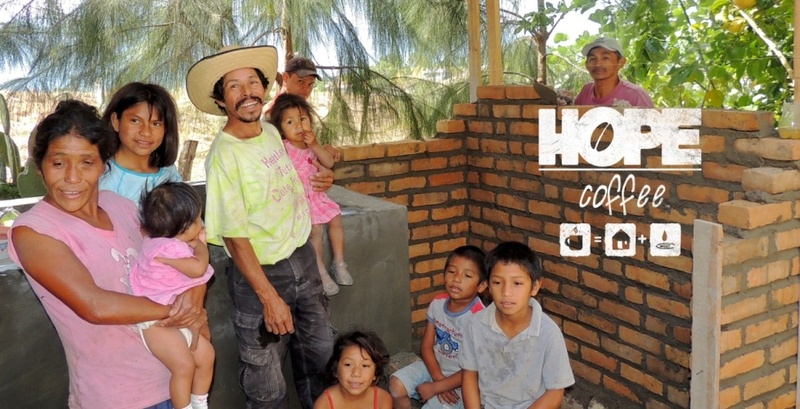 This past month, the Calix family enjoyed running water for the first time in their lives! HOPE Coffee partnered with the Honduran church Iglesia Betel to install a water system, bathroom, and shower in their house. We rejoice in the Lord’s provision! We know that without Him all would be in vain, for “unless the Lord builds the house, the builders labor in vain(Psalm 127:1). In the words of the members of Iglesia Betel, “We want to thank the church body who responded to the Lord’s calling in helping the Calix family. Also, thank you to HOPE Coffee for your generous support.” So, thank you for partnering with HOPE Coffee as you serve and share HOPE Coffee in your local communities and churches!